These healthy & homemade kit kat protein bars are easy to make and require only 4 simple ingredients. These extra crunchy, no-bake protein treats are the perfect post-workout snack. They are entirely gluten-free, paleo, vegan, dairy-free, egg-free, flourless and nut-free. Kit Kat bars were one of my favorite candy treats when I was a kid. I’ve always wondered why they’ve never thought of making a protein bar version of it! But today I’ve decided I’ve had enough. I want my kit kat protein bar! So I came up with this super healthy, extra crispy 4-ingredient protein crunch bar. Kit Kat bars are pretty simple: They are made of 4 vanilla wafers coated in chocolate. Simple but so effective. I juggled with many different ideas before coming up with the last iteration of my protein-packed copycat version. Should I use store-bought vanilla wafers? No. How would I incorporate protein in the recipe if I did so? So I decided to make my own vanilla wafers. I did not want the recipe to get too completed either, so I discarded the idea of making my own “crunchy layers”. I decided to hop at an organic grocery store nearby and started searching for the perfect fit. I ended up picking a box of organic quinoa crackers. The size of these crackers was about 2 inches by 3, but you can go with any size, as long as they are plain and not too thick nor too thin. The ones I picked up were about 1/4 inch thick. The frosting layers are also about 1/4 inch thick. 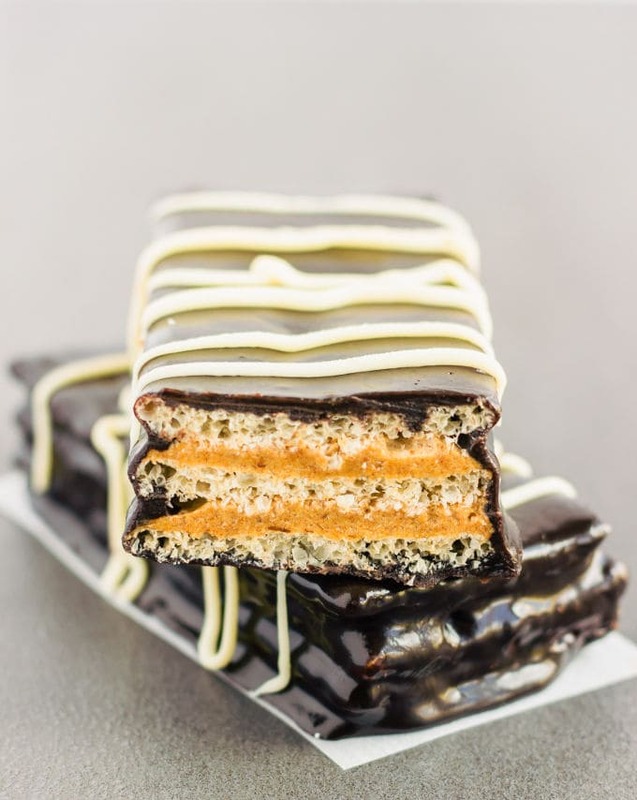 For the final step (coating), simply put your frozen vanilla wafers, your melted chocolate and a baking sheet lined with parchment paper, side to side. 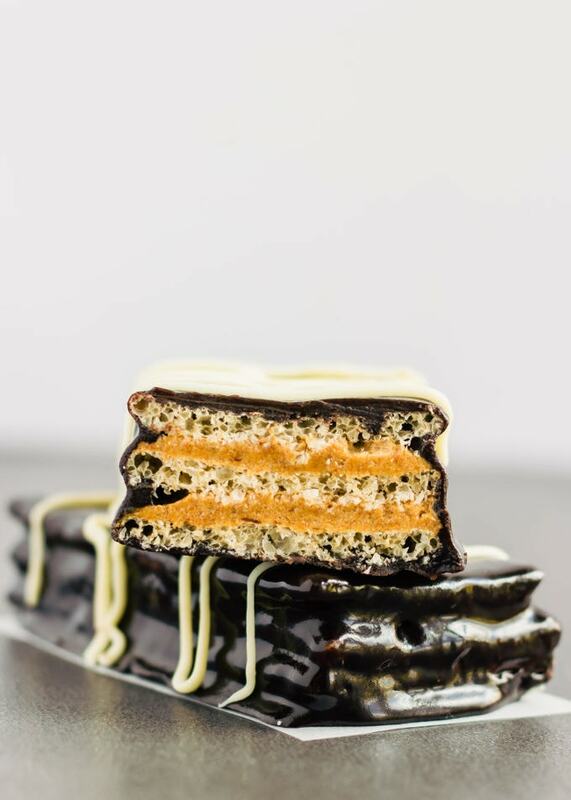 Place a fork or small spatula under your wafer and carefully dip it into melted dark chocolate and spoon some melted chocolate on top of it, slowly coating the whole surface. Then, place the coated wafer on the lined baking sheet. When every wafer is properly coated, transfer to freezer. Store in the freezer in a sealed container for up to 3 months. 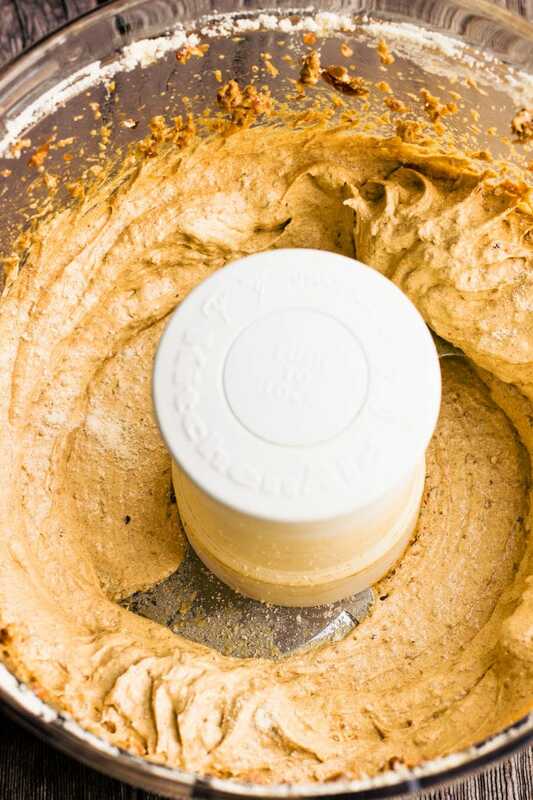 Process dates with the vanilla protein powder until smooth using a food processor. The texture should feel like a thick cake frosting. 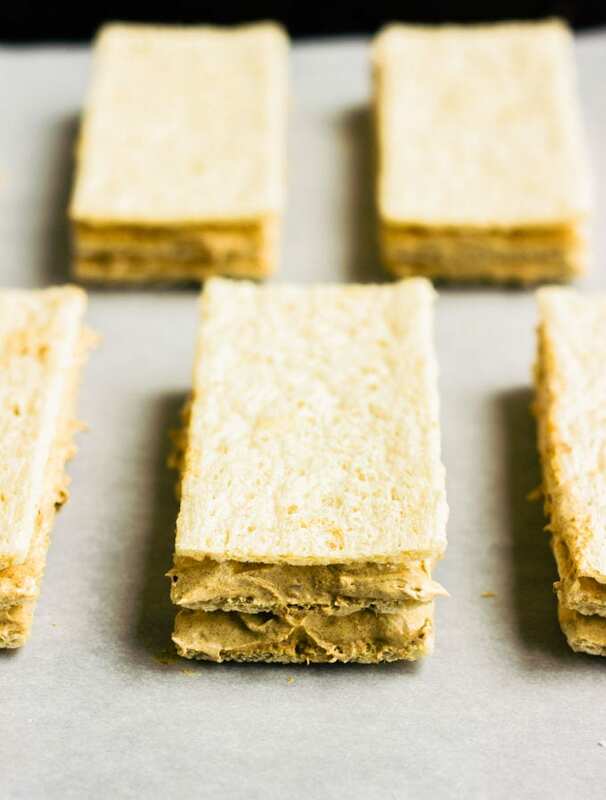 Spread 1/4 inch thick of frosting equally on a cracker for your first layer, then place a second cracker on top, then another layer of frosting, then a third cracker. Repeat process until you are out of frosting/crackers. Place the wafers on a baking sheet and transfer to freezer for at least an hour. Pour the melted dark chocolate in a large bowl. To coat with chocolate, place the wafer on a fork or small spatula and slowly dip it into the melted chocolate. Don't push it too deep. Using a spoon, pour some melted chocolate on the wafer, making sure all of it is properly coated. 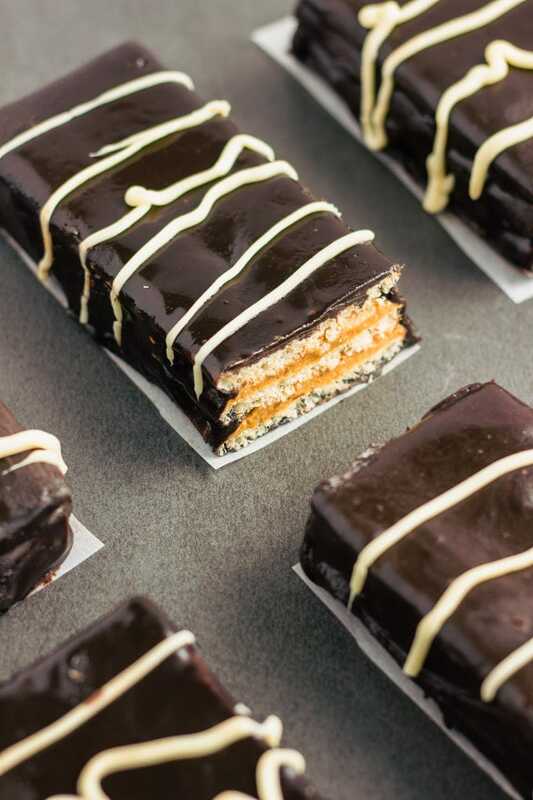 Place the coated wafers on the lined baking sheet. Transfer to freezer for at least an hour. The instructions remain the same, except that you will add 1/2 cup soaking water to the mixture in step #1. * Use plant-based protein powder for the vegan / dairy-free version. ** Any type or size of crackers could be used, as long as they are flavorless. Use paleo crackers for the paleo version. The crackers I used were 3X2 inches. I used quinoa crackers from the brand "The Bread of Flowers". Again, you don't need to use crackers made of quinoa, any type of cracker will do the trick as long as it is flavorless. *** Use a type of chocolate which is compatible with your personal diet. Nutrition information was calculated for the whey version, for 8 bars as the size of the bars in this recipe might be too big for some people. You can either split them in half or buy smaller crackers, to make smaller bars. These look incredible! 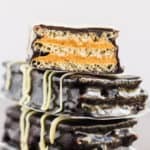 I’ve never thought of making healthy kit kat bars before! Where do you recommend getting the quinoa crackers? The brand I used is called “the bread of flowers”. I bought mine from a local health store here in Montreal. If you can’t find this brand where you live, you could buy them online, if you feel comfortable doing so. Please note that I have never bought anything from this particular website, so I cannot personally recommend them. Finally, any type of cracker with roughly the same size, shape and plain in flavor will do the trick, so if you can’t get your hands on those, I am sure you can easily find a suitable replacement at your local health store.